It should come as absolutely no surprise this week that the world's No. 1-ranked golfer, Dustin Johnson, opens the 147th Open Championship atop the board as the favorite to win the entire thing. DJ opens with 12-1 odds entering the tournament on Thursday, followed closely by the trio of Rory McIlroy, Rickie Fowler and Justin Rose. 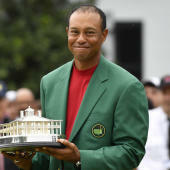 Defending champion Jordan Spieth is listed next with two-time U.S. Open champion Brooks Koepka just behind that foursome, and three-time Open winner Tiger Woods sits less than a dozen spots behind DJ. Check out the latest odds to win the 2018 Open Championship at Carnoustie, via GolfOdds. So who will win the 2018 Open Championship, and what massive long shots will stun the golfing world? Visit SportsLine now to find out and see the full leaderboard from the model that nailed the Masters.